Controversial BCS National Championship Games: A look back at what might have happened in a 4-team playoff–2000. The controversy in the 2000-2001 football season began at the end of the regular season, which resulted in three teams–Florida State, Miami and Washington–all having only one loss. 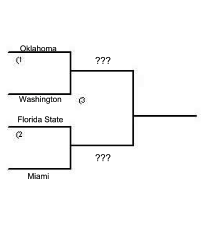 Miami was ranked #2 by both human polls but ended up being ranked #3 by the BCS, even though their only loss was to another 1-loss team, Washington. The fact that Florida State had lost to Miami once in the regular season did not seem to matter in the BCS calculations. 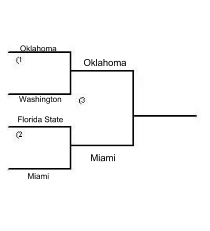 When the Seminoles met the Sooners in the national championship game, they were handed a 13-2 loss, while both Washington and Miami easily won their games, adding more fuel to the fire. 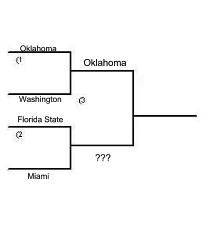 The #1 seed in our hypothetical better-than-the-BCS playoff is Oklahoma, a team that blew through its first four games against UTEP, Arkansas State, Rice and Kansas with a combined score of 173-51 during the 2000-2001 football season. This set up a brutal five-game stretch in which they faced #10 Texas, #2 Kansas State, #1 Nebraska, unranked Baylor and #23 Texas A&M. Oklahoma blew out Texas 63-14, then proceeded to beat #2 Kansas State 41-31. A battle-tested Sooners squad prepared to face #1 Nebraska, and in a packed house at Oklahoma Memorial Stadium, the Sooners beat the Cornhuskers 31-14, becoming one of the first teams to beat the #1 and #2 ranked teams in consecutive weeks. After blowing out an unranked Baylor team 56-7, the Sooners were riding high into College Station to face 23rd-ranked Texas A&M. In a reversal of roles, the Sooners relied on their defense rather than their normally potent offensive output to keep their title hopes alive after a thrilling game with the gritty Aggies. It wasn’t enough though, as the Sooners came back from a 10-point 4th quarter deficit, defeating Texas A&M 34-31. Oklahoma walked over Texas Tech 27-13, heading into the annual Bedlam rivalry ranked #1. Perhaps looking ahead to their rematch against a #8 Kansas State in the Big-12 title game, the Sooners faced an unexpected challenge against Oklahoma State. Oklahoma stormed out to a 12-0 halftime lead, but would not score a single point during the last two quarters. The Oklahoma State Cowboys, playing their last game under outgoing coach Bob Simmons, refused to go away and brought the game within five points after a 60-yard scamper by running back Tatum Bell. However Oklahoma State would get no closer, allowing the Sooners to escape with a hard-earned 12-7 victory. Capping off a magical season that saw them rise from raking #19 all the way to #1, the Oklahoma Sooners squeaked out a win against Kansas State 27-24. Huskies QB Marques Tuiasosopo gets ready to throw. The Washington Huskies kicked off the season with a home game against the Idaho Vandals, and after overcoming some first game jitters, cruised to a 44-20 victory. 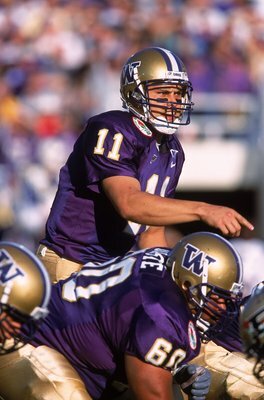 The following week the #15 Huskies faced the 4th ranked Miami Hurricanes, posting the biggest victory of Rick Neuheisel’s tenure at Washington, a 34-29 win. After one of the biggest upsets of the young season, Washington traveled to unranked Colorado, a team that Rick Neuheisel coached the prior year, winning narrowly 17-14. The Huskies were riding high as they sailed into Autzen Stadium to face the University of Oregon Ducks, a team they had beaten 34-20 the previous year. Oregon came in sky high in their own right from a victory against #6 UCLA, and outmatched the Huskies 23-16, Washington’s only loss of the season so far. The following week the Huskies returned home to face 23rd ranked Oregon State, grinding their way to a much needed 33-30 win. The Huskies won their next five games with an average margin of victory of just under a touchdown. Finishing up the regular season in the annual Apple Cup vs. Washington State at Martin Stadium, Washington won its most decisive victory, defeating the Cougars 51-3. Oklahoma and Washington, after each having two very impressive seasons, met at the Sugar Bowl, in a highly anticipated game. 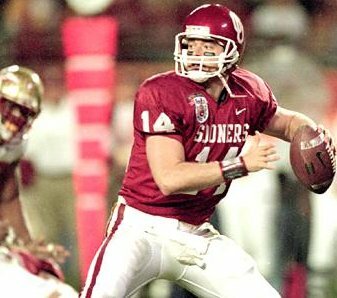 Oklahoma, led by senior QB Josh Heupel, marched down the field on their opening drive, Heupel going 5-7 for 65 yards, capping the drive with a 20 yard touchdown pass to Antwon Savage. On the following drive, the Sooners were gashed on several long runs by Huskies QB Marques Tuiasosopo. After allowing the Huskies to reach the red zone, the Sooners defense buckled down, forcing the Huskies to settle for a field goal. The next two drives by both teams were killed by penalties and a case of the drops by the receivers. With only 2:34 left in the first half, the Sooners got the ball back on their own 33 yard line. On the first play of the drive, RB Quentin Griffin took a dive left to the Sooners 39 yard line. Another Griffin run on the following play brought the Sooners the Huskies 45 yard line. On the third play of the drive, Josh Heupel play-actioned off of Griffin and threw a bomb to Curtis Fagan resulting in a 45 yard touchdown. Heading into halftime, Oklahoma led 14-3. After halftime, it is Washington’s ball and the Huskies seem to be on the cusp of a comeback until Tuiasosopo was intercepted by Sooners All-American Safety J.T .Thatcher, resulting in an Oklahoma touchdown. With momentum solely in their favor, the Sooners cruised to a 35-3 victory, securing a spot in the National Championship game. Florida State QB Chris Weinke showed why he deserved a Heisman. Florida State, the defending national champions, opened their season with a 29-3 victory against BYU. The Seminoles scored 15 points in the first 12 minutes of the game, holding BYU without a touchdown, and extended the current longest winning streak in Division 1 football to 13 games. The next game saw the Seminoles traveling to Atlanta to face Georgia Tech. An overconfident FSU team barely escaped with a 26-21 victory over the Yellow Jackets. The victory required a superb effort from Seminoles QB Chris Weinke, who threw for 443 yards and two touchdowns. Florida State cruised through their next three games against unranked North Carolina, Louisville and Maryland, beating them with an average score of 51-7, setting up a pivotal showdown with #7 Miami. The Hurricanes came in looking to put their own title hopes back on track, scored 17 unanswered points, completely shutting out FSU in the first half. Florida State would mount a furious comeback, taking the lead with 1:37 left in the game. After a heartbreaking loss, the Seminoles took out their revenge on hapless Duke, 63-14. Their next four games followed the same pattern, with FSU beating Virginia, #20 North Carolina State, Clemson and Wake Forest by a total of 184-30. The Seminoles ended the regular season with a 30-7 win over in-state rival University of Florida Gators. The Miami Hurricanes opened their season against a powder puff opponent McNeese State, winning 61-14. Miami traveled to a hostile Husky Stadium to face the #15-ranked University of Washington Huskies, where Washington jumped out to a 21-3 halftime lead, but Miami would mount a comeback before falling just short, losing 29-34. The Hurricanes were ready for battle the next two weeks, beating West Virginia and Rutgers by a combined 111-16. Miami came into the game knowing that if it wanted any chance at playing for the national title game this game was a must win, and with the help of the football gods they did just enough to squeak out a win against the defending national champs. Miami, after starting the game strong and scoring 17 unanswered points, came out flat after halftime allowing the Seminoles to score the first 10 points of the game to get back within striking distance. It was obvious that the game would go to whoever won the fourth quarter. The Seminoles took the lead with 1:37 left to play, but QB Ken Dorsey of Miami marched his team down the field for a score in under a minute. The Seminoles though showed why they were the defending national champions, setting up a 49 yard field goal that would send the game to overtime, but history was doomed to repeat itself once more as Matt Munyon’s kick went wide right. Miami, looking to climb up the polls, thrashed Temple 45-17 and ran away from Louisiana Tech 42-31. The number #3-ranked Hurricanes got ready to face #2 Virginia Tech, setting up the biggest game in Big East history. Unfortunately, the game was a letdown as a result of Virginia Tech star QB Michael Vick’s injured ankle. The victory snapped Miami’s five-game losing streak against Virginia Tech, ending in an easy 41-21 Miami victory. After the Virginia Tech game, Miami rolled through the final third of their schedule, beating Pittsburgh 35-7 and shutting out Syracuse 26-0. In the final game of their regular season, Miami stomped Boston College 52-6. In a highly anticipated rematch, Miami and Florida State faced off in the Cotton Bowl in Dallas, TX. Florida State came in sharp, looking to avenge their only regular season loss of the season, scoring the first 14 points. Miami however refused to go away, tying the game just before halftime, 14-14. The Seminoles opened the 2nd half with the ball and would get a clutch drive out of Heisman Trophy winning QB Chris Weinke, who went 4-4 on 3rd downs for 44 yards on the drive capping it off with a 12 yard pass to former QB-turned-WR Anquan Boldin. Miami answered right back with a 30 yard end-around from WR Santana Moss. They continued to trade scores, and the Seminoles found themselves with the ball at the Hurricanes 39 yard line, with only 2:35 left on the clock. After three unsuccessful plays Florida State was faced with a 4th down and 5, at Miami’s 35 yard line. Instead of risking losing another game to Miami because of a missed field goal, the Seminoles faked a field goal. Kicker Matt Munyon would take the hand off down to Miami’s 3-yard line. The first two runs by HB Travis Minor were stuffed, but on 3rd and Goal from the 1 yard line, QB Chris Weinke ran towards the pylon for the game-winning score only to be tackled just short at the half yard line. Forced to settle, a chip-shot field goal sent the game into overtime. FSU would get the ball first, but a promising drive was cut short by an offensive pass interference call, forcing FSU to settle for a field goal. Miami coach Butch Davis, sensing momentum was on his side, called for the homerun on first down, with Ken Dorsey firing a beautiful back shoulder fade to receiver Santana Moss for the game-winning score. 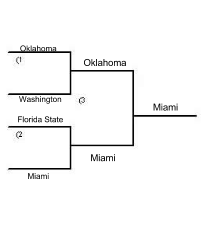 Miami headed to the national championship game to play the still undefeated Oklahoma Sooners. The National Championship game featured the undefeated #1-seeded Oklahoma Sooners and #3 Miami Hurricanes. The Hurricanes start the game with the ball, using a good return from Jason Geathers to reach the Sooners 40 yard line. Ken Dorsey found reliable wideout Santana Moss for an 18 yard pass, racing to the endzone for a touchdown. The Sooners uncharacteristically relied on their rushing attack, led by Quentin Griffin nine carries for 55 yards, capping it off with an 8-yard rush for a score. Miami came back on the field and showcased their big play ability after a 20-yard bruising run by Clinton Portis. 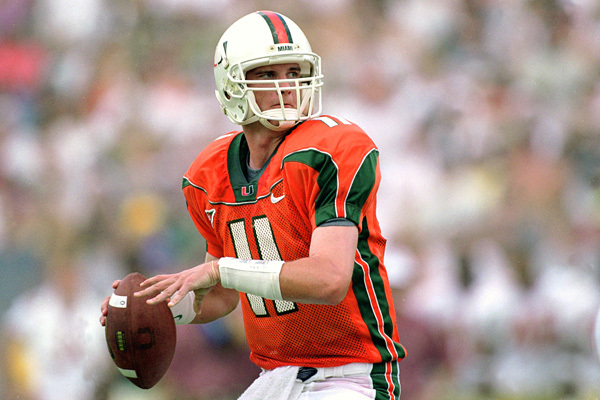 Ken Dorsey responded with a great play-action fake, firing a 35-yard touchdown pass to Reggie Wayne. The Sooners and Hurricanes both mounted two long drives before halftime, but neither came away with a score–Halftime Miami 14, Oklahoma 7. Oklahoma wide receiver Antwone Savage returned momentum to the Oklahoma side, taking a short slant pass from Josh Heupel and racing to the endzone for a 55 yard touchdown. When Miami got the ball back Rocky Calmus forced a bad throw from Dorsey, which J.T Thatcher intercepted and returned to the endzone for his ninth interception and second touchdown of the year. 21-14 Oklahoma. After another 3-and-out from Miami, Oklahoma again had the ball. Miami sacked Josh Heupel for the first time in the game, forcing him into an obvious pass situation on 3rd and 13. Heupel’s pass was almost intercepted, but a heady play from Andre Woolfolk playing like the WR/CB he is, caused the pass to fall incomplete. Miami started the 4th quarter with the ball and mounted a strong balanced drive, punching it in with a 4-yard score. With a tied game, Miami and Oklahoma both mounted long, time-draining drives. Oklahoma got the ball with 3:45 on the clock, but were unable to move the ball. As soon as Miami got the ball, Ken Dorsey dropped back and hit Andre Johnson for a 19 yard pass to the 25-yard line. Oklahoma sacked Dorsey back to the 32, setting up a 49-yard field goal. Najeh Davenport took the field, and after two timeouts from Oklahoma hit a clutch kick as time expired. After the game ended Davenport could be heard telling reporters there’s a reason he didn’t go to FSU. End score 24-21, Miami. Miami comes out the winner after beating the Sooners and handing them their only loss of the season.